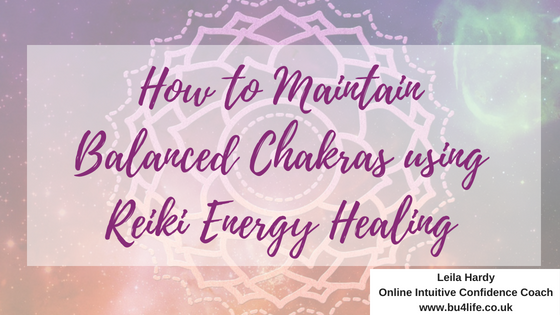 In today's blog, we're going to be exploring the chakras and how to maintain balanced chakras using Reiki energy healing. In my Reiki Level I & II course, I go into chakras in great depth as they are a large part of Reiki healing and how it comes to benefit you so much in your health and happiness. If you don't know me yet, I'm Leila Hardy, your online Intuitive Life and Business Coach. I love supporting women who are empaths, intuitives, healers, holistic therapists and spiritual coaches to fulfil their soul's purpose with unstoppable confidence and ease by clearing out the subconscious and energy obstacles that are in your way around your incredible abilities, making money, having success and maintaining your energy levels and health. Reiki is a huge part of my work, both in helping others to heal, but also teaching Reiki to others to use in their own lives' and businesses. Chakras are energy centres that allow the life energy, life force or Ki around us and within us to be transformed into the various frequencies our subtle energy system needs to keep us healthy. There are seven main chakras that run through the human body, from top to bottom. The lowest chakra, the root chakra, brings in the lower frequencies that are needed for physical survival. Each higher chakra brings in higher energies, such as those for healthy physical pleasure, expressing your will in the world, love of yourself and others, communication, creativity and with the highest or crown chakra bringing the spiritual levels of energy. Each chakra corresponds with a layer of the aura. If negative feelings thoughts can become relaxed and chakras, it reduces the amount of support energy they're able to provide and that is adversely affects one's health. Although not originally part of the traditional Reiki originating in Japan, the chakras have become an optional, yet fundamental part of Reiki healing. Because of the powerful flow of Reiki energy through the body, your chakras can can be cleared and balanced during a Reiki session, so that the life force, the life energy is flowing at the vibration that your body requires for optimal health, inner peace and happiness. This happens quite naturally during Reiki session, knowing that Reiki will always go to where it is required, but practitioners of Reiki may spend more time on specific chakras, if you are expressing symptoms or challenges that may relate to the block or restriction in flow within that chakra. Balancing your chakras is a relaxing, uplifting and enlightening experience. You will feel more grounded, calm and collected, you'll feel happier, you may have of tension, worry and stress, and you may have received intuitive guidance during the session it will allow you to gain clarity and focus on what you need to do next to achieve your goals. Maintaining balanced chakras once they are balanced with Reiki energy healing, is quite simple. Consistency is the key; consistency in checking and connecting with your chakras each day, often throughout the day will help you to understand how that flow changes throughout the day depending on you, your mood, your physical energy levels and who and what you've experienced throughout the day. When you have created a picture of how your chakras operate for you personally, you will know when the flow has changed, what if something has happened that has meant a part of your energy has become blocked or restricted. Regular Reiki sessions, either doing it on yourself, or receiving regular Reiki from a practitioner, is a powerful way to maintain balance chakras on a consistent basis. A weekly, fortnightly or monthly session, just like you would a massage or manicure, is a powerful self-care practice to have in your life. It is an investment in yourself. When your chakras are balanced and maintained over a long period of time, the results and benefits to health are noticeable. General well-being, feelings of happiness, peace and joy are prominent in your life. Those positive thoughts and feelings create a powerful, positive cycle that leads to health, wealth, happiness and success in everything you do!